we wish all our clients and friends a relaxed christmas break and a good start into 2017! Those of you who’ve been outdoors in a landscape covered in fresh snow know the very special dampened sound which makes you feel peaceful (or ski crazy). We’ve simulated that experience in the shop of optician Roland Bischel by covering many surfaces with white acoustic insulation material. So it is not just looking like it has been snowing indoors but also makes you feel you are in the mountains. How cool is that? Loonies will feel at home, too. We received a flag yesterday for our OBENAUF/ building site interventions. On tuesday the first Austrian book prize was awarded to Friederike Mayröcker. Our logo was on air in the prime time news. Two new books just arrived: Fluchtwege and Wachstumsstrategien, both published by Czernin. They make a good pair. Now available at a bookshop near you: the brochure featuring excerpts of the longlist and debut shortlist books for this year's very first Austrian Book Prize. Well done Max, aromatom (brochure typesetting) and Heli Amann (code) and his team. Exactly four years ago Stelzhamerschule school in Linz reopened their newly designed building with giant athletic wall graphics in their gyms. We hope the Stelzhamer pupils still enjoy the murals as much as we do. Photos by the great Herta Hurnaus. Inspired by this cloudy summer we painted some fluffy tools (or tools in fluff?) for the latest OBENAUF/ building site illustration. 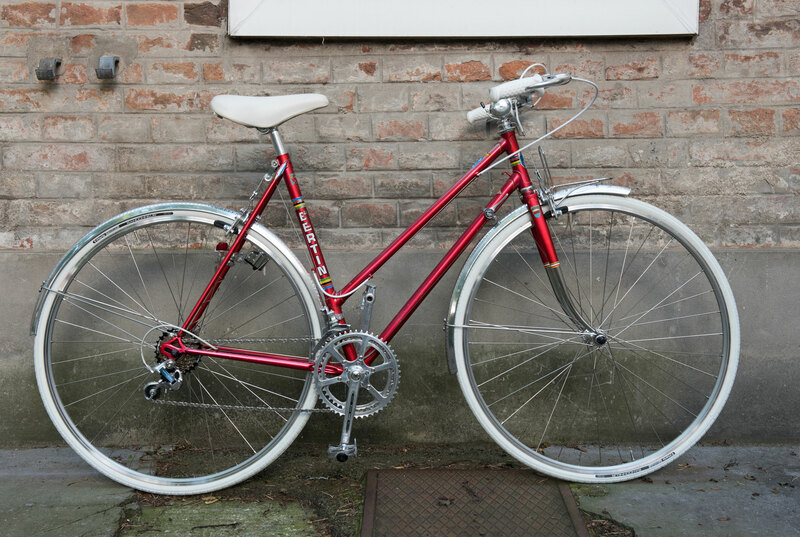 Our hipster department has refurbished this beautiful Bertin bicycle. Before it was a wreck with lots of missing parts (that’s why we got it for free). Now it’s a real beauty again. Purist will probably hate the fact, that it got new wheels and show off fenders but we wanted to build something you can actually use every day. The bycicle’s previous owner had already changed the gear shift and levers. The machine hammerd fenders are as close to the wheels as you can get. Waterdrops between these two parts will probably evaporate by the friction before they reach the end of the fender. We upholstered the seat and worked hard to get the 'MAFAC RACER" breaks working again. Thanks to the French origin of the crank we couldn’t add any off the shelf pedals but had to get vintage ones with the right diameter of the thread. More details maybe once we update the output section again. Need a bigger picture ? To celebrate Clemens Kirsch studios 10th anniversary we designed a giveaway bag for the party. It is a preview of his all new identity coming soon. Plus a follow-up to It's about politics: these were the printed booklets and giveaway bags for the participants! TEH meeting #81 is about to take place in Vienna. sensomatic designed the identity of the conference. Go hear interesting discussions, take part in workshops, dance and listen to great music this weekend at WUK, Vienna! We completely forgot to mention the beautiful website netaffair in our update list. It’s been a while since it went life but that doesn’t make it look old. The site about Europe’s role in the emergence of the internet was part of a research project and its development has stopped with its funding. So you can see the potential of the site but unfortunately can’t access all the materials. We went back in time to the pre computer era and made this rock’n’roll flyer all by hand. They grey colour is a dot pattern for better results at the copy shop. OK. To be honest, the grey pattern has been added digitaly but we did cut different layers of dots to the rigth size and even removed single dost manually. If you want to attend that featured event, follow the trails of the social mania. All sorts of books and their covers — just released by Czernin Verlag. See our typographic contribution to a poem by Maja Haderlap from tonight, 7 p.m. at typopassage Museumsquartier! You can buy the poster from a typographic vending machine there. Siegfried Zaworka's exhibition at kunstraum lakeside in Klagenfurt is on show from March 11th. Go and see the 15 most beautiful books from Austria of 2015 on show at design forum Wien. For the third time in a row our folded poster showcases the selected projects.